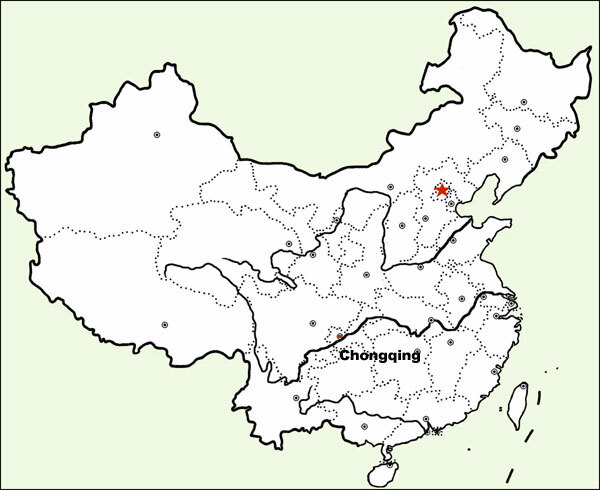 Chongqing is located in Sichuan province and is the commercial and industrial capital of Southwest China. It is one of several Chinese cities directly under the control of the Central Government and viewed as independent from their respective provinces. Containing almost 30 million people, it is a large and densely populated area. The Yangtze and Jialing rivers converge nearby and the area is best known for the Three Gorges tourist attractions. Known as a "Mountain City", Chongqing was originally built on the mountain slopes and along the riversides. It has a long history and numerous scenic spots and historic sites. It is renowned in particular for its unique beautiful gardens. Famous tourist sites include the stone carvings in Dazu County, the Three Gorges scenic area, South Hot Spring Park, North Hot Spring Park, and Red Crag Memorial Museum. Since its founding more than 3,000 years ago, Chongqing has had numerous names that reflect its purpose and role in history, before receiving its present name (meaning "double celebration" and given in honor of Song Emperor Guangzong's ascension to the imperial throne) nearly 800 years ago. From the Shang Dynasty (1766 - 1050 BC) to the close of the Warring States Period (453-221 BC), it was the capital of the State of Ba. More recently, Chongqing was China's wartime capital for much of the Sino-Japanese War (1937 - 1946). The longest continuous war in China's history (1242-1278 AD) was won against invading Monguls at nearby Hechuan. Because of its strategic location on the Yangtze River, Chongqing has a long mercantile history, and in 1891 was established as port with a customs office. It was not until 1929 that it was formally declared a city and a municipality of the Republic of China. After the founding of the People's Republic of China in 1949, the city was made a municipality directly under the central government and continued as the political, economic and cultural center of southwestern China. Chongqing Jiangbei International Airport serves the city and its surrounding area with flights to many cities in China, as well as several international destinations such as Seoul, Tokyo, Nagoya, Bangkok, Munich-Germany, and D'sseldorf-Germany. The airport is located about 20 kilometers (12.4 miles) outside of Chongqing's urban area, and is easy to access by shuttle bus from the city. 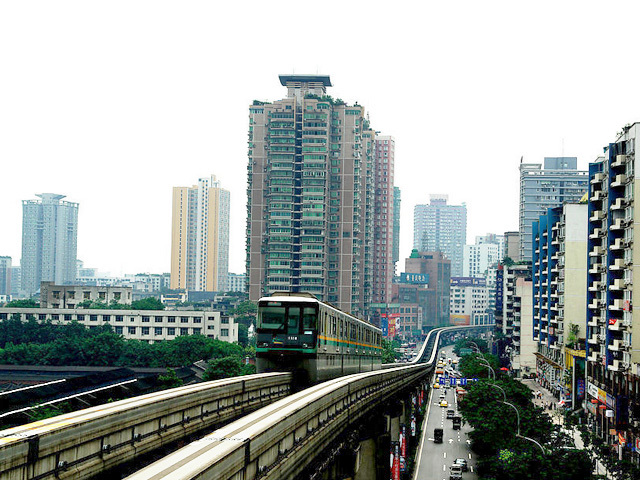 Chongqing's main train station is located in Caiyuanba, next to the long-distance bus station. From this station, direct trains to cities all over China can be caught, such as Beijing, Shanghai, Xian, and Chengdu. Visitors should buy tickets in advance whenever possible which can be done through most major hotels and a large number of ticketing offices throughout the city. The road network in and around Chongqing has been rapidly developed in recent years, ensuring that travel in and out of the city by bus is a viable option for visitors on a budget. Around a thousand long-distance buses are said to leave the city every day. For example, Chengdu is only 5 hours away by coach. The largest coach station in Chongqing is located in Caiyunba on the northern edge of the Yangtze River. Chongqing sits at the confluence of the Yangtze River and the smaller Jialing River, forming the largest port in the upper Yangtze area. Large numbers of boats and passenger ferries use the river, offering visitors' pleasure cruises to Wuhan or Yichang. Longer boat rides to major cities start in Chongqing too, offering a picturesque and relaxing way to travel long distances. The passenger boats fall into four categories: the star-rated boat, the foreign tourist boat, the domestic tourist boat, and the common passenger boat. The accommodation and services offered by the boats vary greatly and visitors should be aware that the cheaper options become quite cramped. The bike is the worst choice for people who aren't familiar with the layout of "the mountain city". First timers to Chongqing should be warned that it is very easy to get lost due to the many hills and valleys. The bus system and light rail are advised as the best forms of transportation. Taxis are cheap in Chongqing, charging just RMB5 for the first three kilometers (1.8 miles) and RMB1.8 for each additional kilometer (0.6 miles) after that, plus a little extra if the taxi has to wait in traffic. Journeys in the city will rarely rack up more than RMB20 on the meter, but crossing the Yangtze River Bridge or the Jialing River Bridge does incur other small surchargess. Drivers are unlikely to speak English or read pinyin: visitors should always have their destination written in Chinese characters if they are not confident with their Chinese.